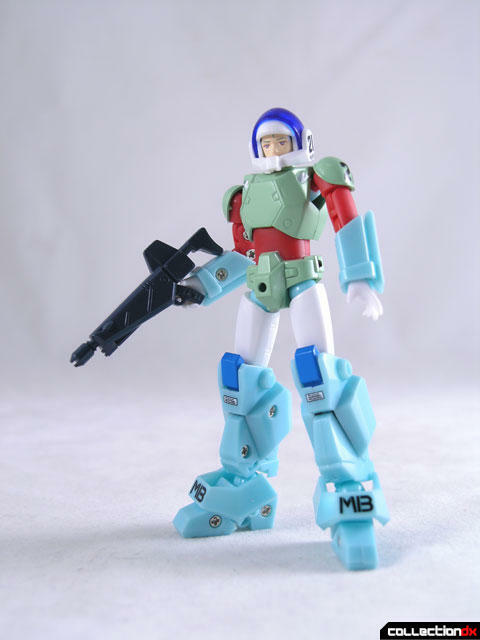 The VR-52F MOSPEADA Ride Armor hails from the anime series Genesis Climber Mospeada, better known as Robotech: The Next Generation here in the states. In Mospeada, the VR-52F ride armor is used by Stick Bernard. 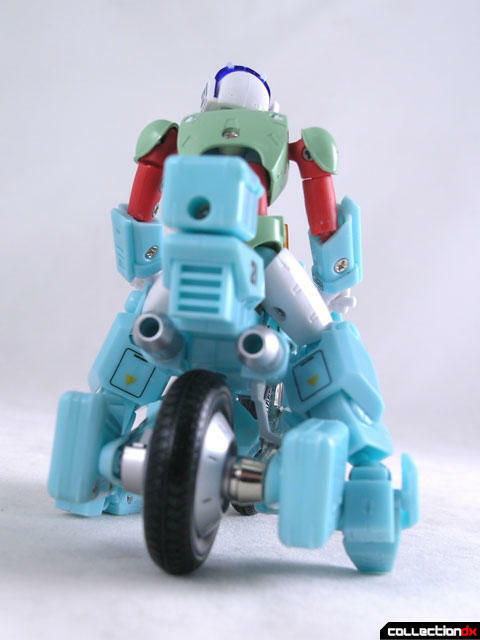 In Robotech he was renamed Scott Bernard and the Ride Armor was renamed the Cyclone. The Stick figure is about the size of a Microman or GI Joe figure. 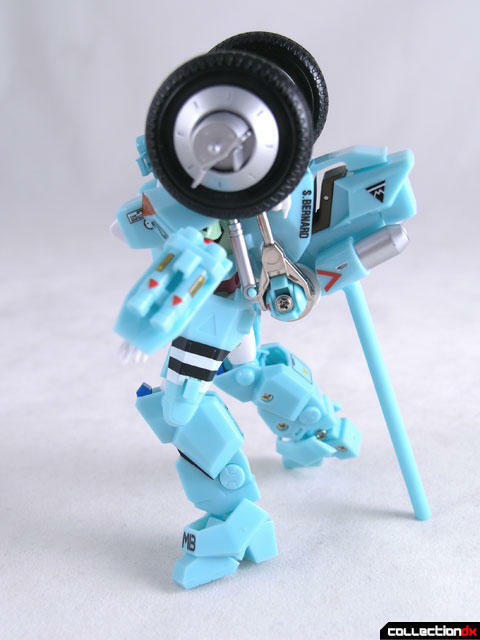 This figure is actually really nicely done, with great articulation and paint detail. 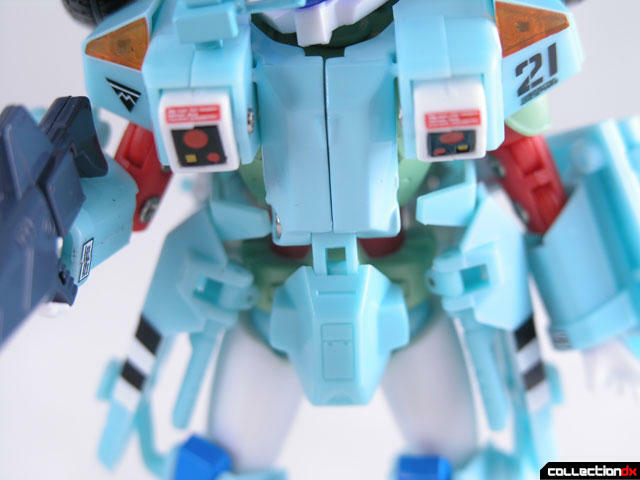 The translucent visor flips up and down, the arms are double jointed and pretty much everything moves where it should. 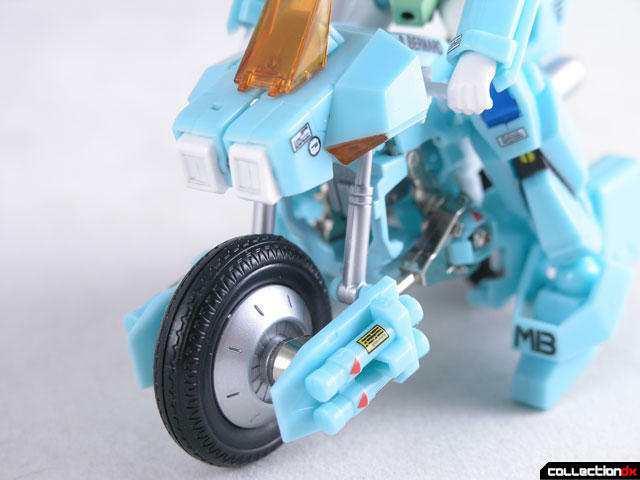 The feet have the pull down action to accommodate the ride armor and they pop out just like the old Gakken toy did. 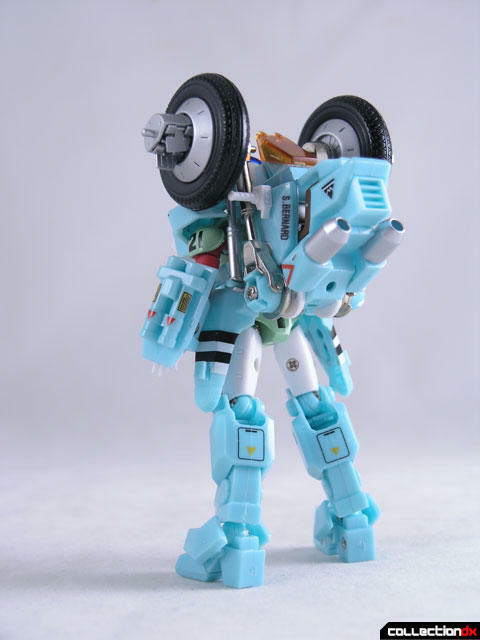 The missile launchers on either side of the front wheel are really awkward. Lets see if I can explain this in a way that makes sense. The struts that come from under the front of the bike are supposed to clip onto the pegs on the inside of the missile launcher plates. This peg is removable, so each time you try to clip it in, it pops out. The front of the panel is supposed to attach to a peg on the wheel, but the hole isn’t deep enough for it to really grip. 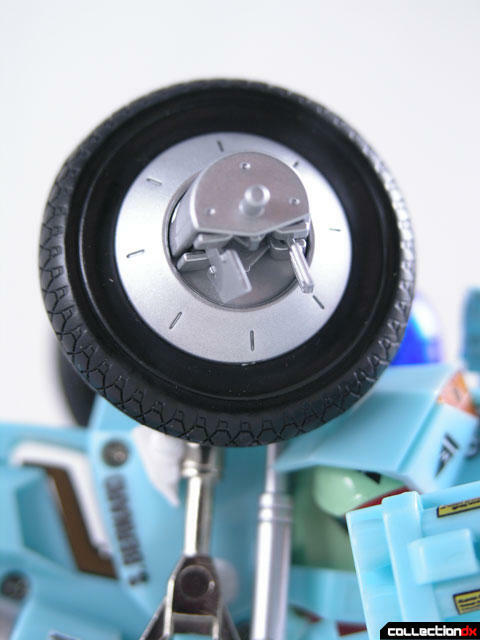 The rear wheel armor has a similar problem. 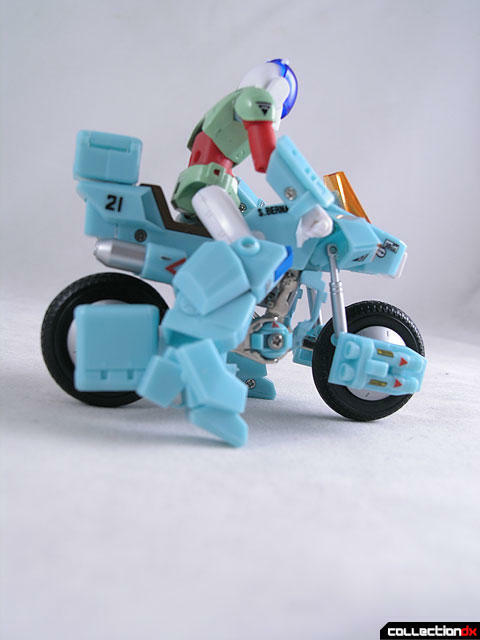 In theory, Stick should be able to ride on the bike, but it takes an extraordinary amount of patience. 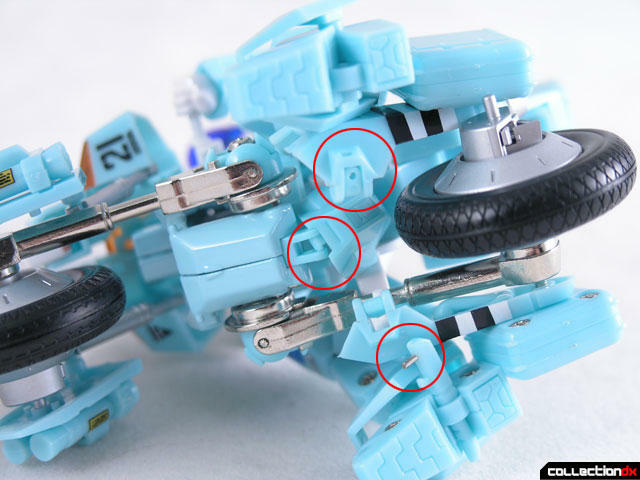 This is the worst part of the entire toy. The interface between the bike and the rider is just terrible. Speaking of crap, there’s the gun. The gun comes attached to a hand, but the glue is so weak that it just pops off. 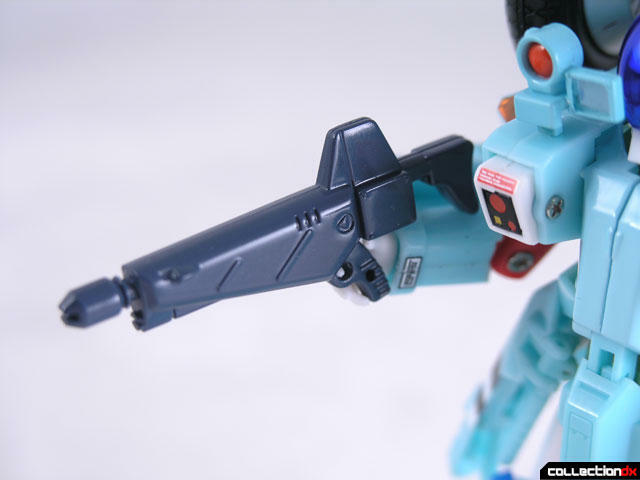 The hand doesn’t stay on that well due to the armor, and then get it to try and hold the gun, well, you get the picture. Ever since I saw the pics of this, I felt kinda skeptical of the way it looked. 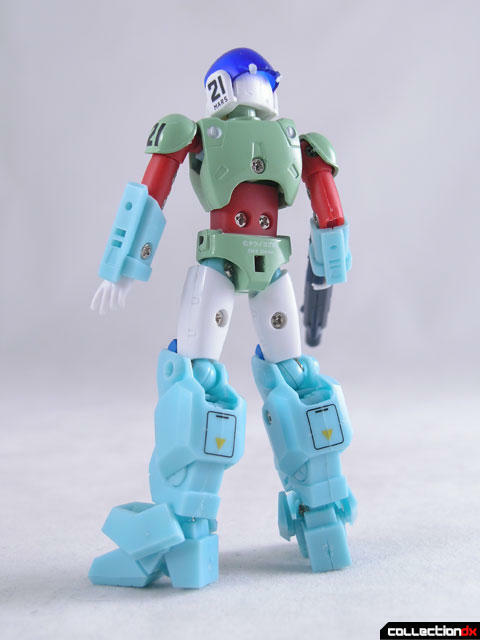 It LOOKS small, the mismatching colors of Stick's torso and the rest of the armor, the color of the rest of the armor (too aqua-teal-minty-green, not military enough). 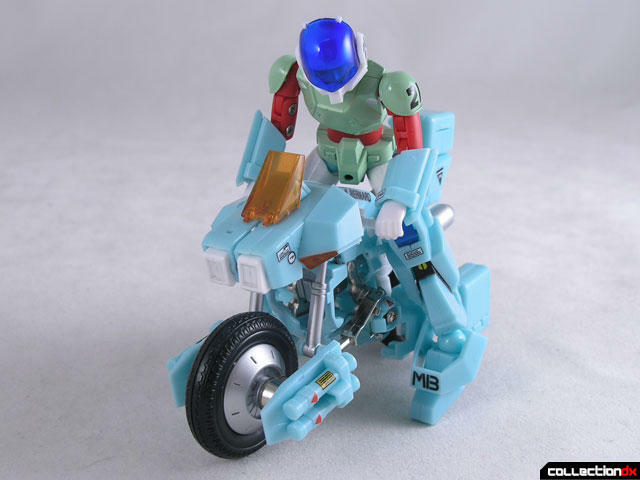 And the figure looks way too big for the bike, or the bike is too small for the figure. Thanks for the honest review. Let's hope Aoshima and Toynami get it right, or at least better. I've got both the Stick and Rey of this. 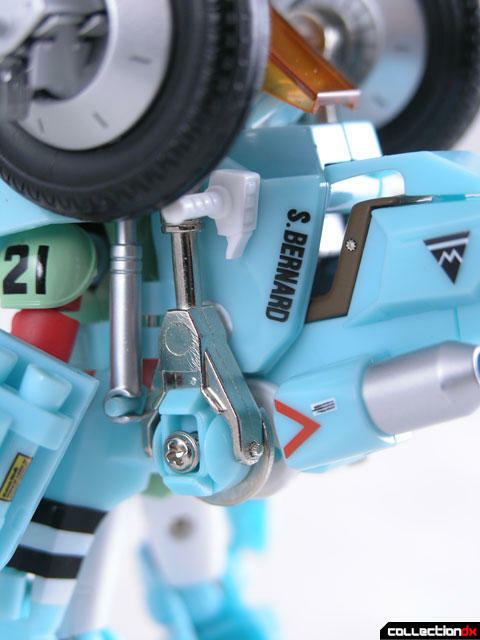 I'm not as disappointed with them as you seem to be, it feels to me like what the old Gakken toys in the small scale should have been, had they had the technology to do so. I really think that this particular design was just too ambitious for CM's, they've never done something this complex and in this scale. I think price was a major factor in their decisions on this item, and it shows. 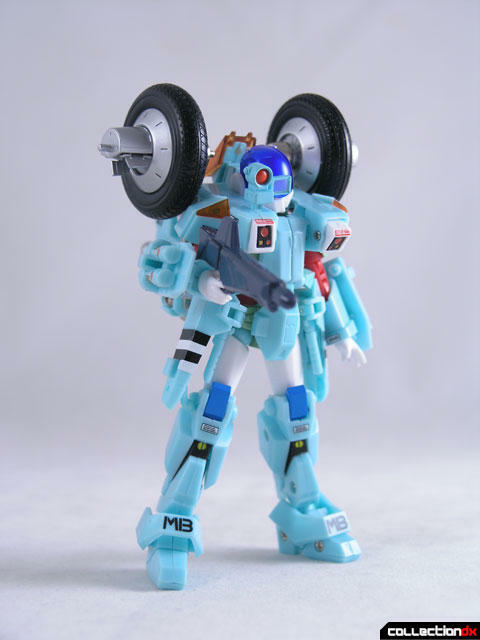 I can only imagine what Takara or Bandai could have done. The Megahouse ones do look a lot better and I'll not be getting the rest of CM's ride armors, in lieu of going with Megahouse. As for Toynami/Beagle/Aoshima, it remains to be seen just what will come of that mess, and I'm not holding my breath for it anytime soon. Im glad I chose the Megahouse one over this now myself. Those screws and the diecast content gave me some concern so I went for the other choice instead. When I looked at the previews pictures a couple months ago, I keep wonder why the color is so, I don't know... Cheap? 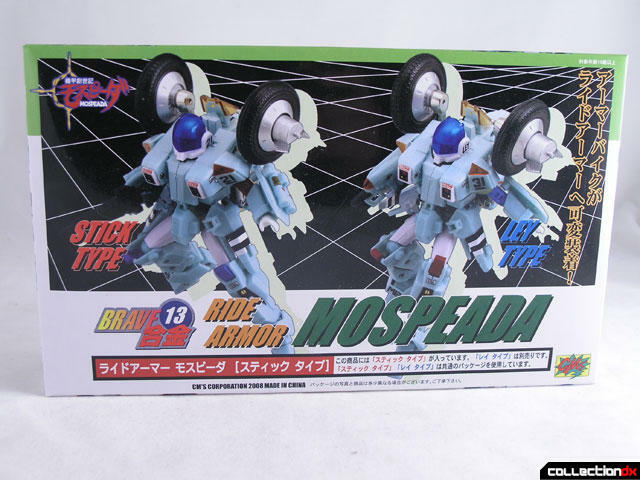 I once saw a bootleg Ride Armour that has the same color as CM one... 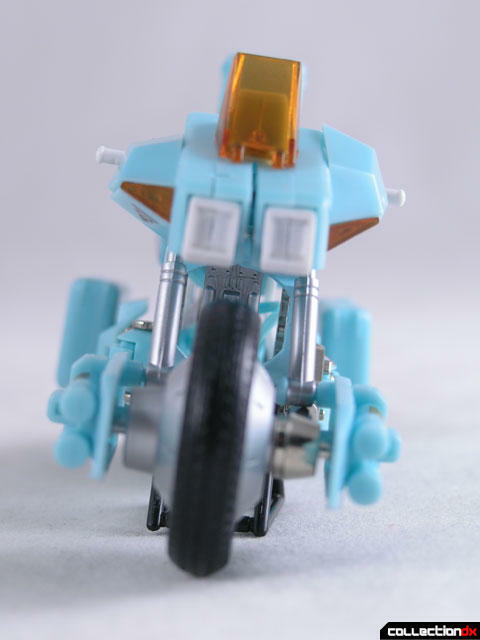 I'm sure this toy doesn't deserve 6000 yen price tag. If it wasn't only 25$, I would be seriously PO'ed. I got one of these thing a couple of weeks back, cause it was only for 25$ at a convention. I finally got time to open it up last night and started playing around with it. The whole transformation is just ridiculous. It wasn't hard to do but it's just not fun to do. I don't get how you got it to stand up straight because once the ride amour goes on, the figure is extremely top heavy. 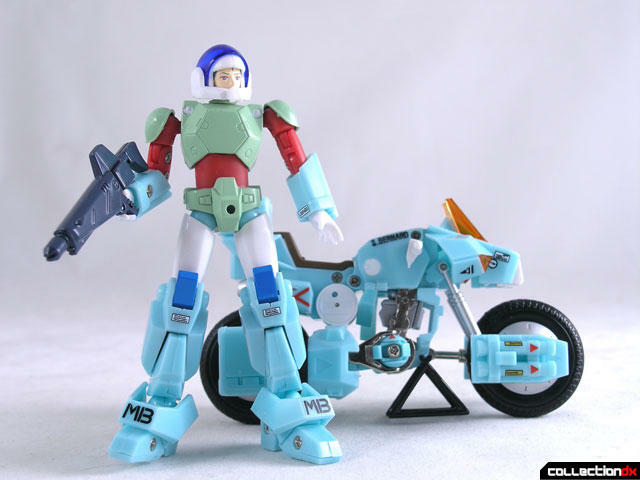 And you were right about attaching the figure to the bike, it's just not going to happen. I tried forcing it and nothing works. I went & done it. I ordered Stick & Lay & have to say I like them both. Yea they are fiddly tho at this scale (1/18) what do you expect. 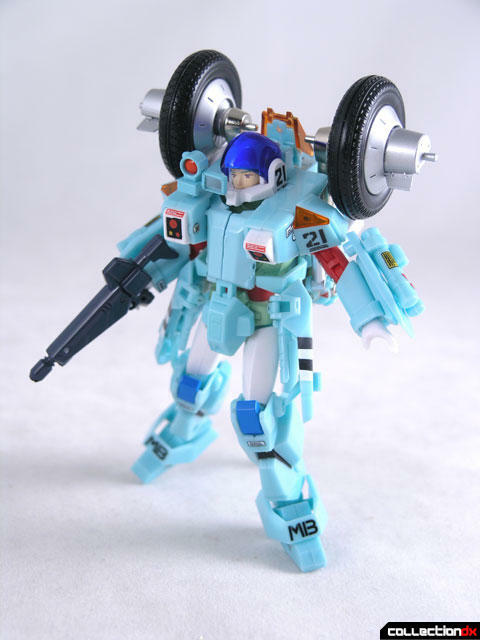 I`ll say one thing these are 1000 times better than the same scale Matchbox Robotech Scott Bernard in his quasi CVR3/Cyclone armor.The cyclone itself looks 1000 times better than the aforementioned Matchbox version. I`ve always wanted to see these at this scale & we have them.Could they have been made sturdier at this scale,I doubt it. 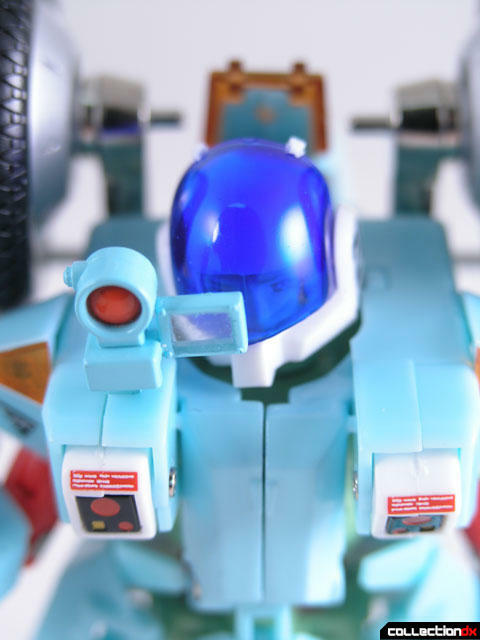 I just hope we will see much more from CM Corp witht he 1/18th line,hell if Macross & dare I say Robotech all came back to 1/18th scale (better technical machinery),I`d be in heaven. One BIG shining bonus with the figures at this scale,you can have Inbid/Invid as the enemy courtesy of Matchbox (when they did the scout & Shock trooper).